In order to put workers first, employers must follow the proper safety regulations and proceed with care when the potential for electrocution is present. Most of the time, these unfortunate incidents can be avoided by employers, property owners and other service or utility personnel since they should always treat power lines, wires and other conductors as if they are energized — even if they look to be insulated or inactive. Sadly, not all employers take these precautions. They sometimes act negligently and put worker's lives in jeopardy. At the South Florida law offices of Friedman, Rodman & Frank , we hold them accountable for the harm they cause. 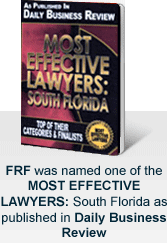 As experienced Miami serious injury trial lawyers, we have handled personal injury cases for people throughout Florida. Experience has taught us that electrocution often happens when people least expect it. Electrocution and electric shock can occur on private property, on construction sites , in manufacturing plants or in public places. Regardless of where it occurs, attorneys at our law firm have the experience, knowledge and resources necessary to help a victim or surviving family member achieve the best possible results in Florida courts. When necessary, we work with experts, including forensic pathologists, construction safety experts, electrical engineers and civil engineers, to analyze the facts of the case. We also investigate the scene of the accident. We take pictures and talk with witnesses while memories of the accident are still fresh in their minds. Working near high-voltage power lines or other live electrical currents is dangerous work. Despite the best training and safety measures, accidents still happen. Electrical surges or contact with electrical currents can lead to serious personal injury and wrongful death. At Friedman, Rodman & Frank, P.A., our personal injury lawyers can represent injured workers — including mechanical workers, utility workers, construction workers and other workers handling or working near power lines and electrical wiring — by helping them obtain the worker's compensation benefits they are entitled to under Florida law. Under the law, the surviving spouses and children of workers who have suffered electrocution while on the job are entitled to death benefits. We can handle these death benefit claims so that families can focus on coping effectively with the grief and loss they have experienced. Contact our South Florida law offices by calling us at 305-448-8585 or toll free at 877-448-8585 or by contacting us online to schedule a free and confidential consultation.